A gilded wood figure of the Buddha, seated with his legs crossed in lotus position with his feet upturned. His draped robes are loosely fitted, leaving his chest and feet exposed. The Buddha’s hands are resting in his lap, forming a variant of the gesture of the welcoming mudra, raigo-in (vitarka). His eyes are closed, the expression on his face is of quiet contemplation. The elongated earlobes are pierced and unadorned and stylised curls cover his head and gather in a shallow topknot, nikkei (ushnisha). Round, clear jewels appear in front of his topknot and the middle of his forehead. 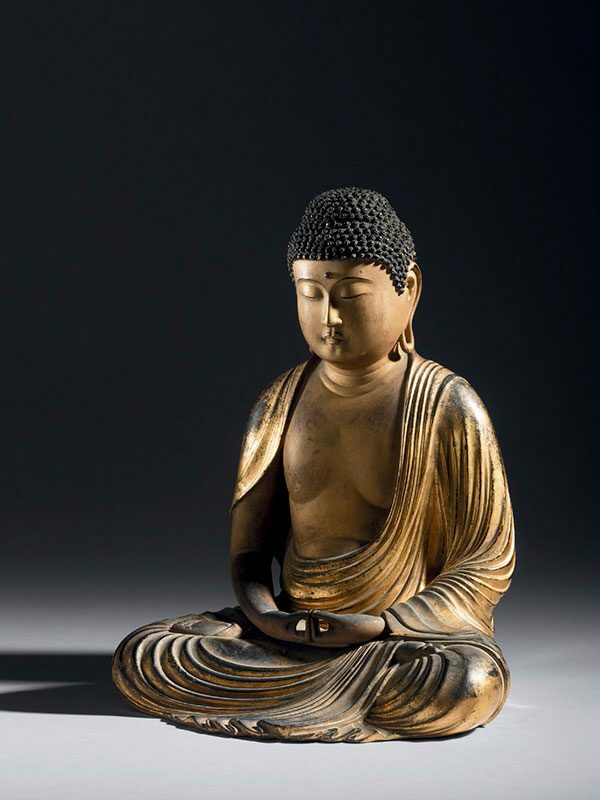 The Buddha has acquired a fine, golden patina, with some areas of the black ground showing through, and the details of his face are delicately painted.